It’s been a hot summer in Lake Dallas, Texas, and trying to stay cool has been a top priority for both humans and animals. 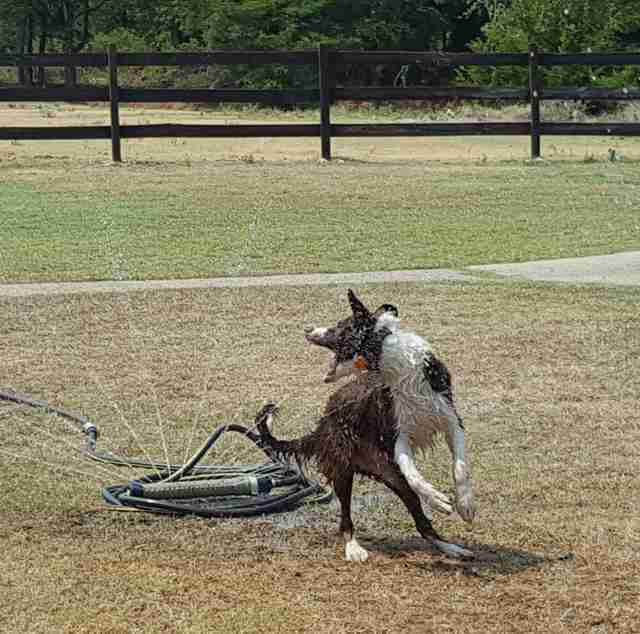 While most have turned to air-conditioning or standing in front of the fridge, one dog named Baloo found a creative way to beat the heat: the backyard sprinkler. 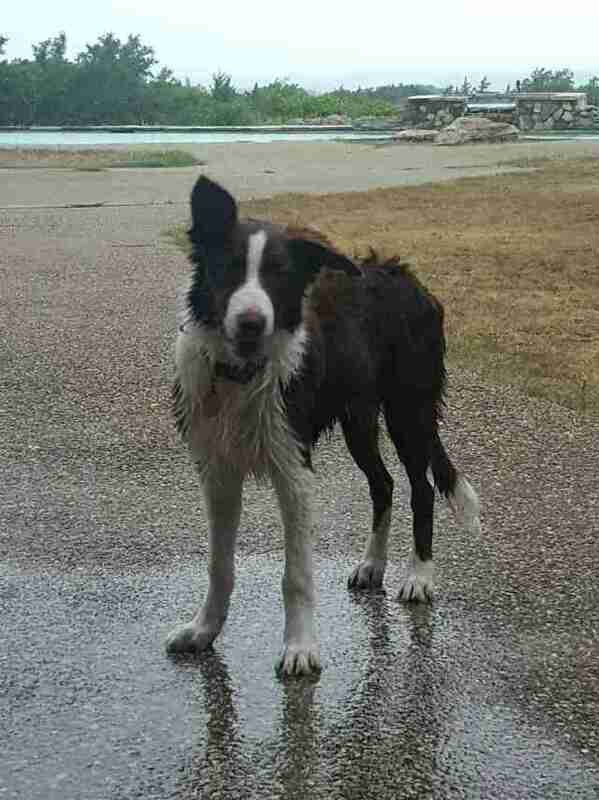 Since the 5-month-old border collie joined Cara Wohr’s family, the young dog has proven himself to be just as clumsy and fun-loving as his “Jungle Book” namesake — but this attitude can get him into serious trouble. Wohr was reading in her bedroom one morning last month when she heard some “banging around,” she told The Dodo. At first, she didn’t think anything of the ruckus — with five dogs in the house, she’s gotten used to a certain level of excitement. But when Baloo wouldn’t stop barking, Wohr went to investigate. Years of dog hijinks couldn’t prepare her for what she found. Baloo had dragged the sprinkler out of the backyard and through the doggy door. 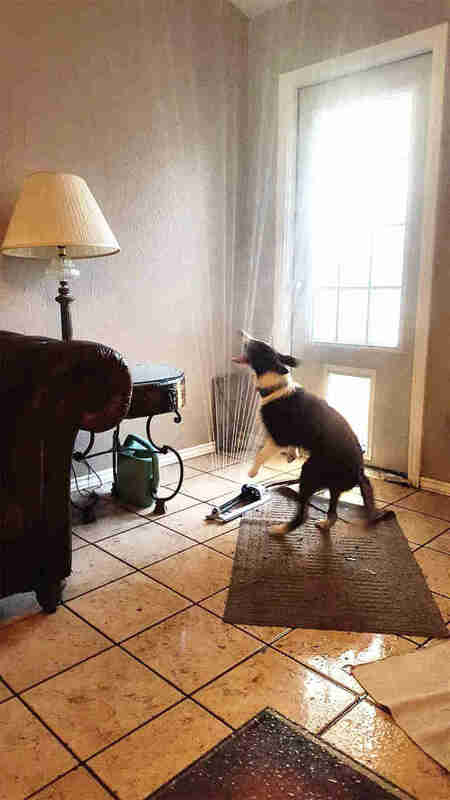 He had been playing with the sprinkler inside for at least a few minutes, and water was everywhere — soaking Wohr’s lamp, ceiling fan, TV, leather chair, coffee table and photo albums. It took a combination of elbow grease and Mother Nature to get things back to normal in the household. “After about five big towels and leaving the back door open for an hour and a half with temperatures at 107 outside, things started drying up,” Wohr noted. 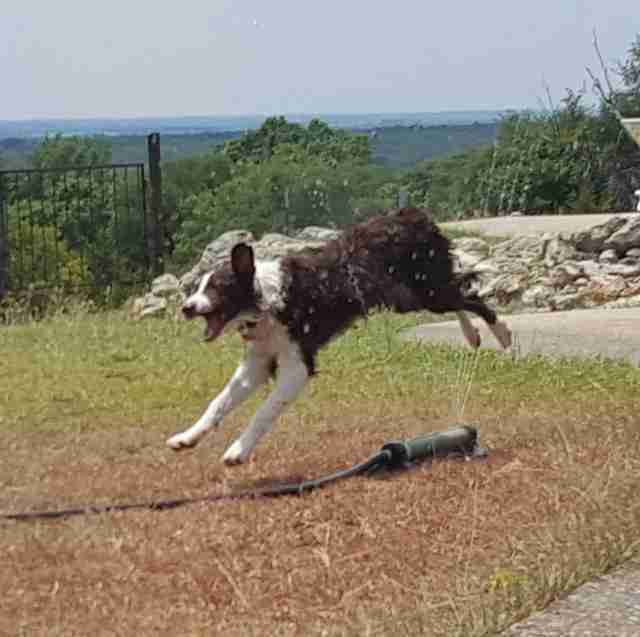 Baloo has been obsessed with sprinklers ever since temperatures started spiking in June, and since then Wohr has had trouble separating her playful dog from his favorite water toy. Since the incident, Baloo’s love affair with the sprinkler has only heated up. He spends hours running through the streams of water, or just standing in its cooling spray. 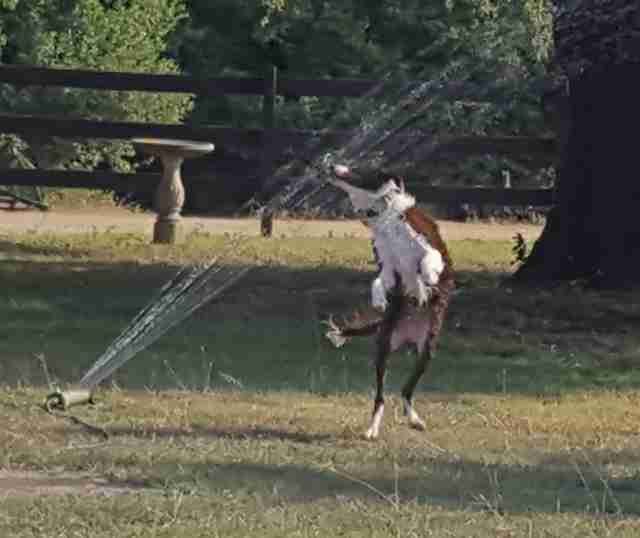 Wohr posted the photo of Baloo’s sprinkler incident on Facebook, where the hilarious image has since gone viral. “Good thing I was wearing waterproof mascara,” Wohr wrote in the caption. But for Wohr, Baloo has brought her so much happiness that no amount of water can dampen their relationship.